Scouts-Many-Marshes is an Argonian blacksmith employed as a dock worker in Windhelm. He and his clansmen reside within the Argonian Assemblage and can be seen working around the Windhelm docks. He offers common level Light Armor training. After completing a task for him, it is possible to marry Scouts-Many-Marshes. Scouts-Many-Marshes begins his day at 6:05am with a quick breakfast. He will eat for an hour before returning to bed for an extra hour. At 8am, he truly begins his day by going out onto the docks to work. He will spend the next twelve hours of his day begrudgingly working out on the docks. He will return to his bed at 8pm after a hard day of labor to prepare for the next day. Scouts-Many-Marshes wears a set of clothes and a pair of boots. He carries an iron dagger to defend himself. Besides that, he carries a key to the Argonian Assemblage and a selection of lower-class items and gold. When approaching Scouts-Many-Marshes he may make a remark on the Argonians' willingness to work for any of the local ships: "Shatter-Shield, East Empire Company... we'll work for any ship that pulls in, as long as they can pay." He might make a comment about the local environmental conditions: "The water is cold, but it's a lot better than having to work up in the dry air." Scouts-Many-Marshes may talk about how he wishes there was not the ever present racial tension in Windhelm: "I wish the Nords, Argonians and dark elves in Windhelm got along better." Or about how the Argonians are doing the hard work that the Nords are not willing to do themselves: "We Argonians do the work the Nords don't want to do." When ending a conversation with him, he may say goodbye in two different ways. If you are an Argonian, he will say: "I hope we will speak again soon, marsh-friend." If of a different race you will instead hear: "May the earth beneath your feet be always soft." Ask how long Scouts-Many-Marshes has lived in Windhelm and he will reply: "I came here as a hatchling. The only thing colder than Skyrim is the Nords themselves, but we stick together." 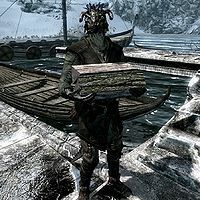 Inquiring as to why all of the dock workers are Argonian results in a somewhat triumphant reply: "We work where we can get work. The Nords don't like unloading their ships, so we do it instead. Sometimes cargo goes missing." Asking him for Light Armor training while your Light Armor skill is below level fifty will have him reply: "You'll be able to run circles around the big, slow brutes in Heavy Armor." If you complete the Battle for Windhelm and Ulfric Stormcloak is dead, Scouts-Many-Marshes may remark as a greeting: "It's a new day in Windhelm. The Stormcloaks are gone, and so is their prejudice." You can ask Scouts-Many-Marshes if he's glad to see Ulfric gone, to which he'll respond, "You have no idea. Did you know it was his decree that forbade the Argonians from living inside the city walls? I hope in his next life, he's reborn as an Argonian forced to live in a slum because of some bigoted Nord dictator. I'm joking, of course, but I'm a lot happier seeing the Empire running things in Windhelm." Scouts-Many-Marshes will make a comment on how the Shatter-Shields are treating Argonians poorly if you are not currently doing the quest A Few Words with You: "We're used to getting by on scraps, but the Shatter-Shields want everything for nothing." If you ask him if something is troubling him, he will go off on a tirade against one of his employers: "Torbjorn Shatter-Shield. I wish someone would beat the coin out of his fat fists. He clings to every Septim. He says an Argonian's labor is only worth a tenth of a 'proper Nord worker.' My people are not slaves!" Offering your sympathies but not your help will have him say: "We will make do somehow. We always have." Agreeing to help him will have him comment on his stubbornness: "You can try, but we've gotten nowhere talking to him ourselves." If you succeed in talking Torbjorn down, Scouts-Many-Marshes will thank you by giving you a reward of two fortify-skill potions or three restoration potions and saying: "You talked Torbjorn down? I'm impressed. Here, I was saving this for a rainy day. Maybe now I can afford a few more for my people. Take it." Strangely, Scouts-Many-Marshes considers Ulfric Stormcloak to be a friend under the relationships tab of his actor entry in the Creation Kit. Scouts-Many-Marshes: "Why do the Nords bother you so much, Ambarys?" Ambarys: "Why do you even need to ask? They treat your people as bad as they do mine." Scouts-Many-Marshes: "I think that's just their way. The Nords don't like anybody who's not a Nord, but they're not bad people, deep down." Ambarys: "Look around you. Don't you know what their little war is about? They want all non-Nords out of Skyrim. That means you and me." Scouts-Many-Marshes: "Oh, I doubt that very much. Who would load their ships, then?" Ambarys: "Just you wait and see." Ambarys: "How much do they pay you per day?" Scouts-Many-Marshes: "That's really none of your business..."
Scouts-Many-Marshes: "Eight septims per day, plus lodging." 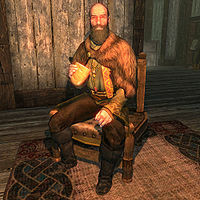 Ambarys: "Eight septims for breaking your back, and then you live in squalor. How much is your dignity worth?" Scouts-Many-Marshes: "If it's all the same to you, Scouts-Many-Marshes prefers to eat and drink in peace." Ambarys: "Sorry, my scaly friend, you've come to the wrong place. Around here we don't ignore what's happening in the world." The radiant AI system may prevent you from being able to get the objective that raises Scouts-Many-Marshes' disposition to marriage level. As such, you may not be able to marry him. ? This page was last modified on 31 March 2019, at 04:52.